In the Americas, all countries have a national risk management and disaster response system of a multisectoral nature, with a central coordinating central agency whose name varies from country to country: Civil Protection or Defense Agency, National Emergency Bureau or Commission, National Disaster Agency or Department, etc. These systems and agencies work jointly with all sectors and institutions, including the ministry of health and the entities within it. It is important for the health sector to be well acquainted with these intersectoral bodies. The sector’s participation and coordination in processes related to risk management, preparedness, and response will not only benefit the work of the ministry of health, but the entire range of institutions responsible for emergency and disaster work. It is common to witness direct coordination between national risk management entities health sector institutions. Cross-sector agencies and organizations can include social security institutions, armed forces health services, health services of private businesses or nonprofits, private health care establishments, religious groups, Red Cross, volunteer fire department health services, and others. In some cases, these entities assume more active roles that the ministry of health in the national disaster system. 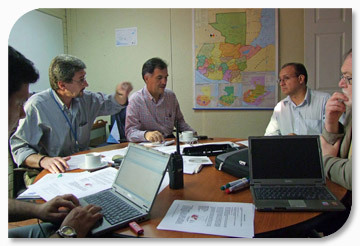 A similar coordination model should be in place at the intermediate and local levels and the health sector technical units in charge of emergency and disaster management should always have an up-to-date inventory of civil society institutions, agencies, and organizations—including international organizations—that work in the field of disaster management ‘in normal times.’ These units should also maintain a database of national and international agencies that working in disaster response and humanitarian assistance. Experience proves the value of developing agreements or establishing routine working relationships and/or memos of understanding that facilitate coordination during a major emergency or disaster. A lack of previous knowledge of the operational capacities of all the actors involved can lead to chaos. Coordination is not improvised.